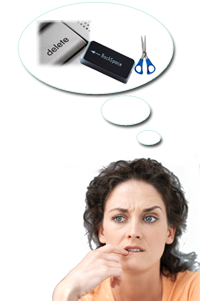 DELETE, BACKSPACE, and Cut: What Are the Differences? When do I use Delete, Backspace, and Cut? DELETE: On most extended PC keyboards, the DELETE key’s near the HOME, END, PAGE UP, and PAGE DOWN keys, between the alphanumeric keys and the numeric keypad. If your keyboard has a numeric keypad, you’ll find a DELETE key on it as well. Laptop keyboards have a slightly different configuration, so you may need to search for your DELETE key if you have a laptop. On my large laptop, there’s a DELETE key on the top row of keys, above the Backspace key. When you press DELETE in a word processing program, the program deletes the character to the right of the cursor. To delete an entire word to the right of the cursor, use CTRL + DELETE. You can also delete an image from a document by clicking on it and then pressing DELETE. BACKSPACE: The BACKSPACE key on a PC keyboard is on the same row as the numbers. 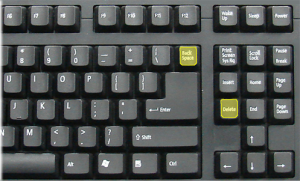 Many BACKSPACE keys have a left-pointing arrow on them to let you know that it deletes characters to the left of the cursor. This is the best keyto use to correct a typo you’ve just made. To delete an entire word that’s to the left of the cursor, use CTRL + BACKSPACE. DELETE and BACKSPACE work the same way when you want to delete an image . . . just select the image and press DELETE or BACKSPACE. Cut: The Cut command has an icon that looks like a pair of scissors. You can usually find Cut on a toolbar or ribbon along with the Copy and Paste commands because they work together. Cut, Copy, and Paste commands are also on Edit menus. Like DELETE and BACKSPACE, Cut allows you to remove text or images from a document. Before you can cut something, you need to select it. For example, to delete a word, double-click the word to select it, and then click the Cut command. You can also use the keyboard shortcut CTRL + X to cut selected text or a selected image. When you use the Cut command with selected text or graphics, what you cut moves to the Windows Clipboard, which is part of your computer’s temporary memory. To retrieve something you’ve cut, you’d use the Paste command. Cut and Paste allow you to move something from one place in a document to another place in the same document or to a different document. If you’re not planning to move the selected text or image, I suggest you use DELETE or BACKSPACE, so you’re not using your computer’s resources to keep the cut text in the Clipboard. The Clipboard clears when you restart or shut down your computer. If you cut something and then cut something else, the first thing you cut gets wiped off the clipboard. So if you’re going to paste, remember to do so as soon as possible after cutting! How are the Cut and Copy commands different? The Copy command leaves a copy of the text or image in its original location. The Cut command eliminates it from the original location. This is an example of one of the topics covered in my six-week online keyboarding class. 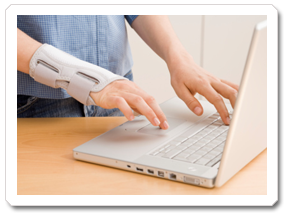 Repetitive wrist motions in activities such as typing can cause a painful condition in the wrists and hands known as carpal tunnel syndrome (CTS). Every year, thousands of office workers contract CTS, a debilitating injury that costs millions of dollars to employers, as well as the health—if not the livelihoods—of employees. Although typewriter keyboards have been part of many people’s working lives for over a century, they didn’t cause CTS. Time-saving computer keyboards, ironically, are the source of the problem. Workers may be happy that they don’t need to interrupt their work every few minutes to change ribbons or insert a new piece of paper. But the uninterrupted, repetitive motions that characterize computer keyboard usage (particularly data entry) open the door to trouble. A data entry clerk who types 40 words per minute could perform the same repetitive motion nearly 80,000 times in one workday. Workers in other industries, such as food packing and automobile assembly, have suffered from repetitive-motion injuries for years. But the condition went largely unreported until recently—perhaps because it now afflicts large numbers of people who work in media. What causes carpal tunnel syndrome? It happens when the median nerve gets damaged. The median nerve passes through the arm and wrist into the hand, on the palm side. That nerve supplies the thumb, index finger, middle finger, and part of the ring finger with sensation and muscle control. It passes through a narrow space in the underside of the wrist called the carpal tunnel. Damage can cause severe swelling or compression of the nerve, resulting in tingling, numbness, or pain beginning at the tips of the thumb, index, or middle finger. Symptoms of CTS span from occasionally annoying to frequently excruciating, and in rare cases, to complete disablement of the wrist muscles. If left untreated, CTS can progress from “just a little tingle in the fingers” to severe pain and possibly even numbness in the hands. Some believe that to get CTS, you must be predisposed to it. Many of the things you can do to relieve or prevent CTS—such as taking frequent breaks and performing exercises—cut into productivity, so employers may not want you to do them on company time. However, I know of some employers who encourage employees to take exercise breaks. To prevent CTS, try to keep repetitive movements to a minimum. Don’t type so quickly, and try to relax a bit, relieving tension and stress on the hand muscles and ligaments. Reducing the speed and force with which you touch the keys on your keyboard can reduce your risk of CTS. Try to take periodic breaks to relax your hands. If you follow these steps daily, you can prevent long-term work loss and medical expenses costing thousands of dollars. Other things can help too. For instance, by positioning your computer display and keyboard properly, you can reduce the flexing at your wrist as you type. Always try to sit using good posture. After typing a while, just sit up straighter; you’ll feel an immediate improvement. Align the top of your video display with the middle of your forehead. Your eyes should be looking at a point that’s just about in the center of the video display. You won’t be as likely to slouch, thus bending your arms and wrists into the “risk” position. Position your keyboard so your arms can hang straight down from your shoulder to your elbow and slightly downward from your elbow to your hands. Avoid a cold environment. Temperatures significantly lower than normal make the tendons in your hands less flexible and therefore more prone to irritation and swelling. It’s difficult for me to type in a cold room because my fingers feel stiff. An adjustable computer screen and a movable keyboard can help make your typing motions less repetitious. If you’re working with a laptop, move it around your desk periodically to adjust distances and viewing angle. If you think you have CTS, see your doctor as soon as possible. The condition is progressive, and early treatment can prevent permanent damage or the need for radical measures. If you let it go too long without treatment, you may need surgery to relieve the pain. Your doctor may also recommend devices, such as straps or braces, that relieve the pain and are relatively inexpensive. Place your arms down at your sides and sit up straight. Stretch your fingers, and hold that position for a count of 10. Make a tight fist for five seconds, and then relax your fingers. Try to do this three times. Rest your right elbow on a table, and then gently pull back on the fingers of your right hand with your left hand. Hold the position for five seconds, and then repeat with the left hand. Put your hands over your head, and stretch as far as you’re able to. Now put your arms down and repeat this movement two more times. Don’t look at the monitor while you’re doing these exercises. Look at something as far away as possible. This will relax your eyes and reduce overall tension, making you less likely to stress your wrists as you work. Pick one of these exercises and try it right now. Excerpt from my online Keyboarding class.